The concrete castle boasts 44 rooms, 18 fireplaces and more than 200 windows of varying sizes and shapes. The interior walls, floors and ceilings are elaborately adorned with an incredible array of Mercer’s original handcrafted tiles. 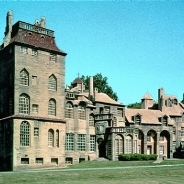 Mercer incorporated his own tiles into Fonthill’s architecture as well as Persian, Chinese, Spanish, and Dutch tiles he had collected.